With odd socks, we start the conversation about Alzheimer's and support Alzheimer's research. Confusion. That's what Alzheimer's patients are struggling with on a day-to-day basis. 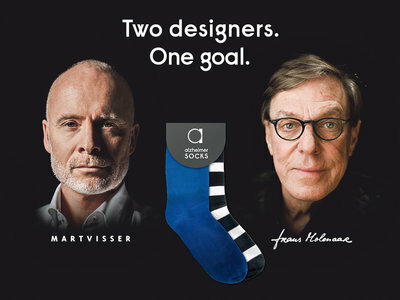 Two of Holland's top fashion designers – the late Frans Molenaar, who himself suffered from Alzheimer's disease, and Mart Visser – have designed two different socks that symbolise this confusion. The proceeds from the sale of the socks will be passed on to Alzheimer Nederland to benefit research into the disease at VU University Medical Centre in Amsterdam. By introducing the Alzheimer SOCKS on World Alzheimer's Day, the creators of Alzheimer SOCKS want to break the taboo and get the conversation started among the public. 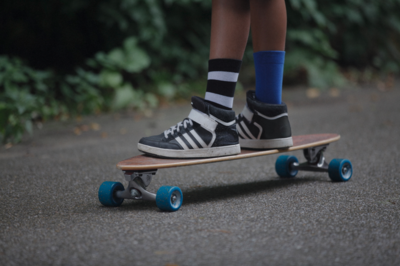 The blue sock has been designed by Mart Visser, while the black-and-white sock has been designed by the heirs of Frans Molenaar, who was Visser's mentor and close friend. Frans Molenaar himself came to be affected by Alzheimer's disease. The iconic black-and-white colour palette that he used for all of his 99 collections is also represented in his sock. Mart Visser: "With Frans Molenaar, I experienced up close what Alzheimer's disease can do to someone. And I also noticed that we still find it difficult to talk about this disease when we find that one of our loved ones suffers from it. With these socks, I hope that we create conversation and raise money to find a solution." Today is World Alzheimer's Day, which endeavours to raise worldwide awareness of Alzheimer's disease, the importance of research into medication and the impact of this disease both on patients and their loved ones. And there still isn't a cure for this disease, despite the fact that 1 in 5 Dutch people is affected by Alzheimer's or another form of dementia. Alzheimer's doesn't only affect people in the final years of their lives. Many people aren't aware that this disease also occurs among young people.